How do you handle another person’s frustration, disappointment, or anger? It’s not always easy, is it? Last week our normally upbeat child found herself dealing with circumstances that left her frustrated and disappointed. A verbal processor to the core, she shared her feelings with one of her friends. Big mistake. Apparently the conversation hadn’t gone as planned. She expected sympathy. Instead she got truth. “Welcome to real life” were the exact words, I think. Not exactly the warm, understanding response she hoped for. The truth stung. “I wish you’d been here yesterday. Talking to you always make me feel better. You listen.” It was a very good mom moment. And while most of these strategies have their place, leading with any of these eventually results in more frustration rather than less. Over the years I’ve learned to lead by listening. 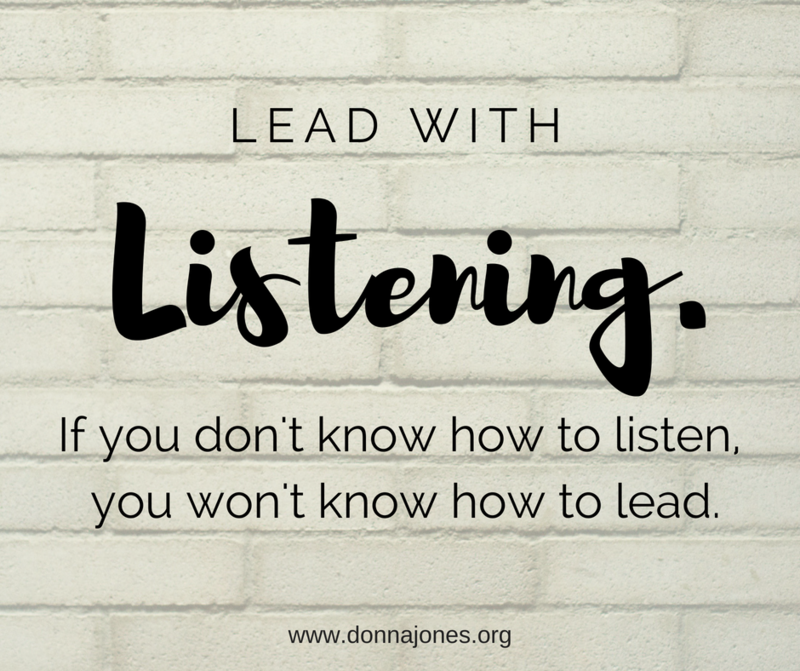 If you don’t know how to listen, you won’t know how to lead. Listening is the key to handling difficult emotions. With your child. With your spouse. With anyone. Here’s why: when a person expresses emotion, but doesn’t feel like they’re being understood, they respond in one of two ways. It works like this: Your child (or husband, friend, or co-worker) is angry, disappointed, or frustrated. Of course we’d all like to receive a gentle tap on the shoulder followed by, “Excuse me. I’d like to express my deepest emotions: I’m feeling particularly grumpy because I wasn’t invited to the party, had a horrible day at work, feel stinkin’scared to start middle school/high school/college, had a lousy soccer practice, or broke up with my girlfriend”. But let’s be real. Instead, negative feelings manifest themselves in behaviors, attitudes, or words. People escalate because they’re screaming to be understood. If we refuse to understand, eventually, they’ll say something like “You just don’t get it” or worse yet, clam up, code for “this conversation is over, and nothing—and I mean NOTHING—will get me to open up about the situation now”. Escalate or end. Doesn’t sound very hopeful, does it? So what do we do? How do we handle difficult, negative emotions, when honestly, we’d really like them to disappear, thank you very much? First, let me be clear. We can’t allow our kids’ negative emotions to run rampant, taking the whole family down with them. In the name of allowing a child to “express themselves” I’ve seen parents allow their kids to talk so disrespectfully, I almost couldn’t believe it was real. I’m as tough as nails on disrespectful behavior. It just doesn’t fly in our house. Ever. That being said, generally (not always) we start by addressing the internal issue (what’s going on in the heart) before we address the external issue (the resulting behavior). We do this by listening. For one thing, we can’t listen if our child won’t talk. I mean really talk. Not vent. Not complain. Not whine. Not scowl. Not sulk. Talk. In my experience, people don’t always want to tell you what sparked the emotion (sometimes they don’t even know!) but they will answer the more generic, “what’s up?” Verbal processors will jump at the chance to answer; internal processors will hesitate until they’re ready. Respect both. Then, when they talk, just listen. Don’t try to fix the emotion before they’ve expressed the emotion. But listen first. Because if you listen to them, they’ll listen to you. So lead by listening. It won’t stop the negative emotions, but it will help you handle them wisely. understand the real issues, not just the presenting ones. open the door to pour truth, perspective, and wisdom into another person, in a way they will receive. make your people feel loved, valued, and understood. By the way, I overheard my child tell her grandmother, “Well, my situation is just part of real life”. They’re listening more than we think. But everyone must be quick to hear, slow to speak and slow to become angry. Did you know you can find out more about building a healthy family by accessing Donna’s newest Bible Study “Get Healthy: Family”, online? Simply go to www.crosslinechurch.com or click here.